TESDA delegates headed by Executive Director Maria Susan P. Dela Rama paid a courtesy call on Ambassador Joseph Del Mar Yap at the Philippine Chancery on Monday, 24 September 2018. 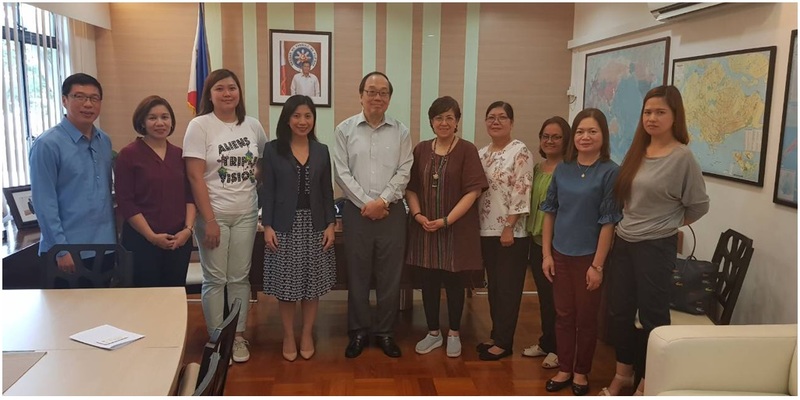 TESDA Executive Director Maria Susan P. Dela Rama briefed Ambassador Yap on the onsite assessment program (OAP) of TESDA for our overseas Filipinos workers (OFWs) here in Singapore. She also conveyed the institution’s continuous commitment and passion to help upgrade the skills of overseas Filipinos in Singapore through the yearly conduct of the OAP. The OAP is intended to assess the skills of training graduates and issue a Certificate of Competency or National Certificate to those who successfully pass the assessment. Such assessment is based on promulgated Philippine Competency Standards and Assessment Tools, which allow national recognition of the said TESDA issued certificates.